This past Saturday we went to see Cabaret and it was an excellent, if a bit depressing, show. As usual after seeing a show, we went to dinner at a within walking distance restaurant. 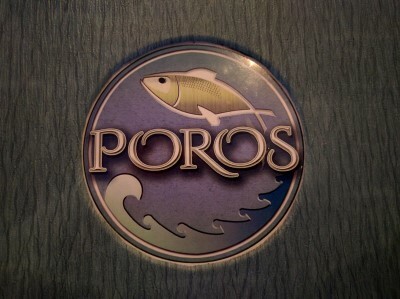 This time we decided to try Poros, a recently opened (October 2015) restaurant in PPG 2 Market Square from The Big Y Group. It seemed pretty big inside and was spacious (generous space between tables), with large comfy looking booths plus tables and lots of blue tones and an ocean feel. From our table we had a view of the tree and out the windows, the ice rink. I had to ask our server for help choosing a wine because I didn't recognize any of the Greek, Turkish, Israeli, or Moroccan wines. All I knew was I wanted a white wine. Poros offers a sample before committing to a wine so I tried a taste of two Greek white wines. First, Ambelos Phos 2013 which was like a fruity sauvignon blanc. Second, Santo Assyrtiko 2014, which was more like a chardonnay. 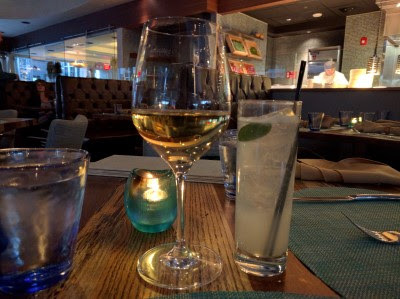 Both were quite good but the Assyrtiko was more interesting to me, so that's what I ordered. SP chose the Ouzito Cocktail (ouzo, gin, sage, lemon, fizz). 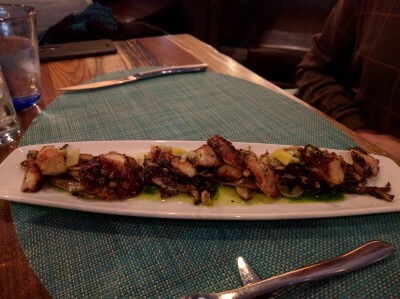 SP started with Grilled Octopus (grilled fennel and radicchio, preserved lemon, parsley sauce, shallot & caper citronette). A closer view of the octopus. 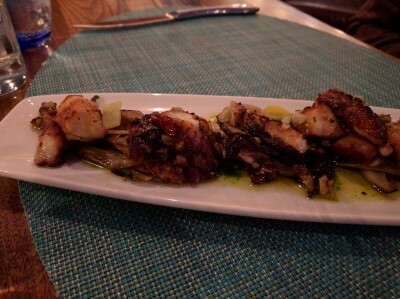 The octopus was nicely cooked and tasty but I thought the buttery sauce in the bottom of the tray tasted a little garlicky, or maybe just shallot-y, so I didn't eat much of it. SP enjoyed it a lot. I ordered 4 small plates for my meal. 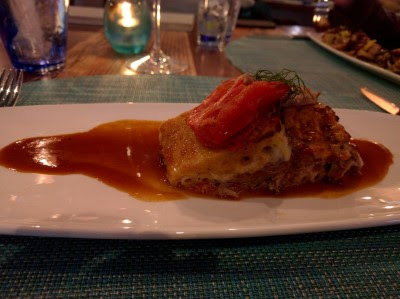 The first to arrive was Elysian Fields Lamb Pastitsio (braised shoulder, pasta, tomato, allspice bechamel). It was delicious. The lamb was so tender and flavorful. When we made pastitsio at home we used ground lamb - never again. So much better with braised shoulder. The one odd thing: we were dining early (reservations at 5 pm) and our server had to check if there was any pastitsio left! It's a very popular dish but still, to have only 2 servings left a bit after opening for dinner at 5 pm seems odd (although lunch does run until 4 pm, but still...). It seemed like the rest of our food arrived a little quickly. For his meal, SP chose Whole Lavraki (branzino) (1.38 lbs, prepared a la plancha, extra virgin olive oil, sea salt and black pepper, seared to a crisp on cast iron plancha, served with roasted garlic skordalia). 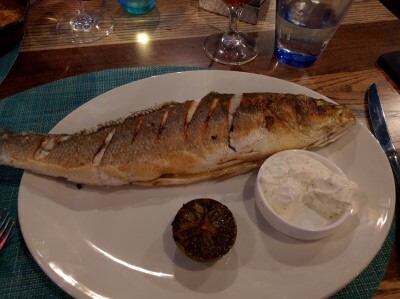 The fish market serves whole fish and fish fillets prepared one of 3 ways: chargrilled, a la plancha, or tandoor roasted. The tandoor was not an option the evening we dined. Shellfish (shrimp, scallops, lobster tail) can be added to your fish for an additional cost. He ate his whole fish! 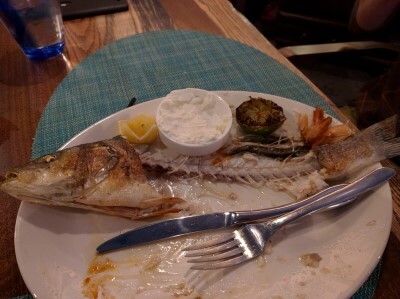 He said it was very good but he would have preferred a composed plate of fish, vegetable, and starch to just the fish with a sauce. 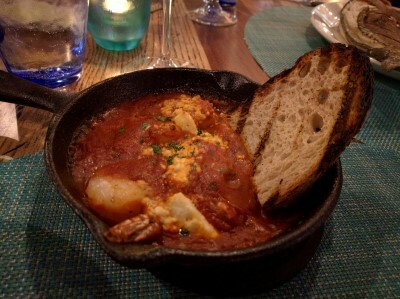 Meanwhile, I was enjoying Shrimp Saganaki (roasted tomato coulis, feta, grilled Mt Athos bread). Four shrimp in tomato sauce with feta and grilled bread to mop up all the sauce. It reminded me a bit of the lamb neck at Butcher & the Rye, a protein in a red sauce with grilled bread to mop up the delicious sauce. 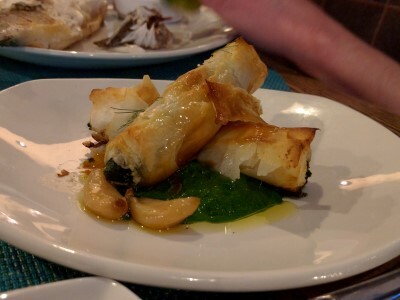 I also ordered House Made Spanakopita (spinach, filo, feta, manouri cheese). This was a mistake - just look at those 2 huge garlic cloves. I couldn't eat it / didn't want to risk it so SP ate it and said it was tasty. The spinach seemed almost pureed smooth. 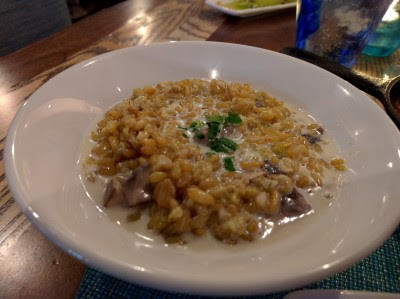 I also ordered Kamut & Freekeh Risotto (wild mushrooms, kefalotiri cheese). I'm not sure why. I like other grains like kamut & freekah and I like risotto plus cheese so I figured I'd enjoy this, but, not so much. It didn't look like risotto. It looked more like cereal in a bowl of milk and I didn't like the milk flavor. I was getting full, as was SP, so we brought it home and ate it for lunch the next day. He said it was OK but he probably wouldn't order it again. Just not our thing. 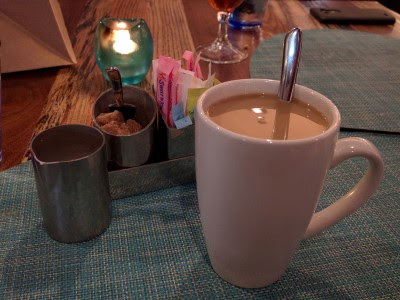 I ordered decaf coffee while we looked over the dessert menu. It was good coffee, though I am far from knowledgeable about coffee. We ended up sharing two desserts. 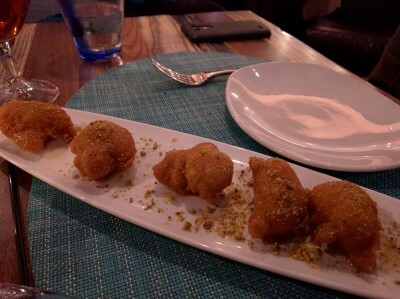 One was Loukoumades Doughnuts (honey syrup, pistachios). 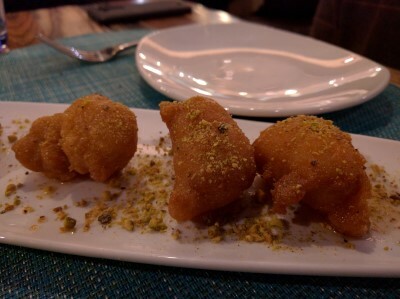 Closer view of the fried dough. These were good, just the right size for sharing. I'm not sure I could have eaten 5 on my own. 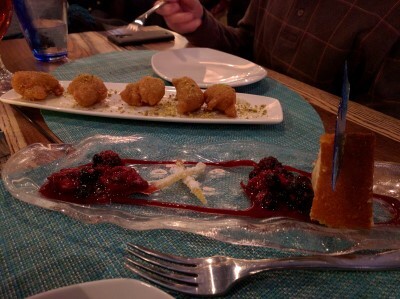 The other dessert: Yiaoutopita Lemon Pound Cake (mint berry salad, lemon syrup, candied lemon). 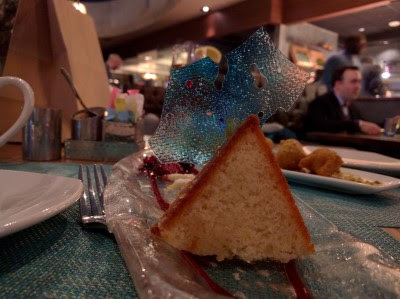 Two piles of berries, two criss-cross candied lemon strips, a triangle of lemon pound cake and a thin, blue sugar glass. We both thought the pound cake was a little dry and dense but the berries & candied peel were delicious. We definitely scooped up all the berry mixture. 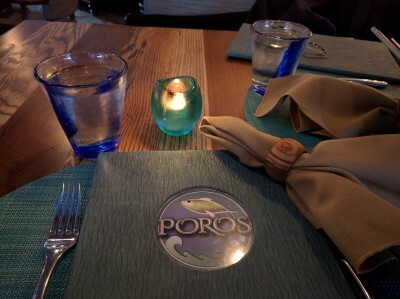 Overall, we liked Poros. Our server was friendly, knowledgeable, helped me pick out a wine and helped SP choose a cocktail. After our appetizers, the rest of meal arrived a bit too quickly as we were not yet finished with the octopus and pastitsio. I like the atmosphere a lot, the muted blues and other ocean colors, the space to move around, it wasn't too loud, you weren't seated on top of the people next to you. I think in the warmer months the outdoor patio will be fabulous, overlooking Market Square or the ice rink areas. 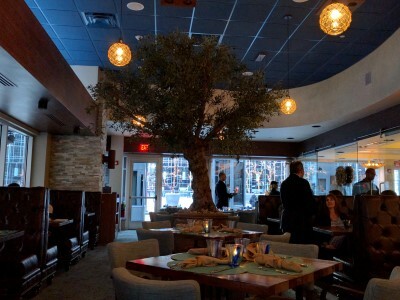 It is one of the pricier meals we've had in Pittsburgh and given the large number of dishes with garlic, to which I am if not actually allergic then definitely very sensitive, it probably would not be our first choice for a meal in that price range. However, we would go back. I just hope they make more pastitsio so they don't run out!